Don’t know about you but we are big market and street food lovers for this reason South East Asia in general is a paradise for us. 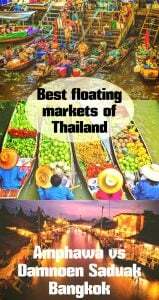 Floating markets sound even more interesting and appealing that’s why to visit at least one of them was in our bucket list for Thailand. 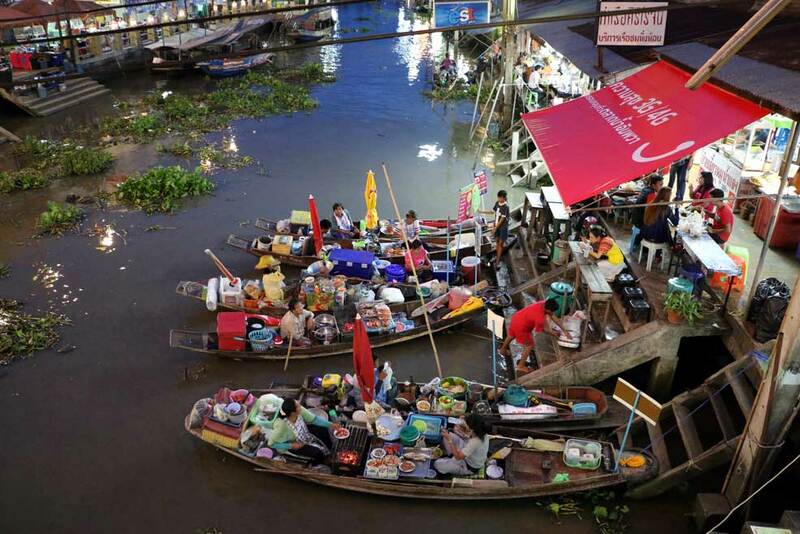 There are two main floating markets near Bangkok; Damnoen Saduak and Amphawa market. The first one is the most famous and touristy, the second one is supposed to be more local and authentic. We went to check and compare two of them and on the way stopped at two railway markets including famous Maeklong market. The first market on the way was at Maha Chai station, we didn’t even know about it, just got off the train to switch the station and found ourselves in the middle of the market. 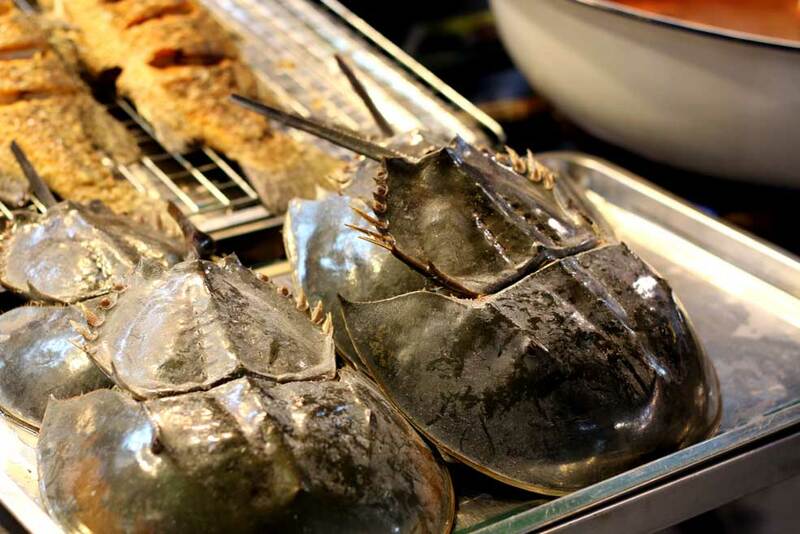 The main product is fish and seafood, dried, fried and fresh. I’ve never seen soo many different dried fishes! If you want to try some this market is the best one to buy, here everything is cheaper than in the other three. Late afternoon we arrived at Maeklong market, it was such a contrast, after absolutely local authentic market at Maha Chai, without any tourists, Maeklong wasn’t great. Exactly the same type of market, along the railway, with same kind of goods to sell but mentioned in tourist guides. Imagine our surprise when on arrival at the station we saw hundreds of tourists with cameras taking photos of a train going “through” the market. 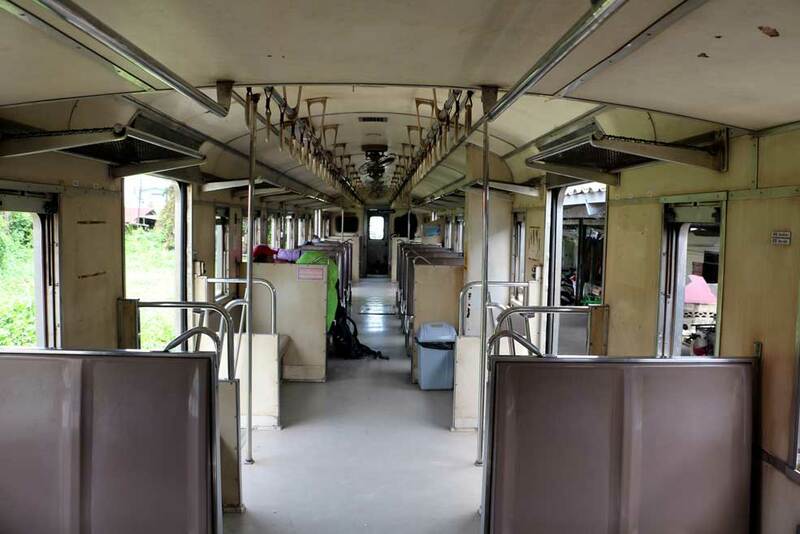 Some even ‘ventured’ to climb on the train when it stopped and took photos inside like if the train was anything special, just a normal non AC train you get everywhere in Thailand. Our train from Ban Laem to Maeklong train station. From Maeklong railway market we headed to Amphawa floating market. The market is opened only at the weekends, Fri – Sun, the main show starts when it gets dark. Other days it’s very quite with almost nobody around, typical small town in Thailand. We arrived at Amphawa on Friday around 5pm., walked through the market in search of accommodation and it didn’t look very alive. Two hours later we went for a walk and the market was all shining and sounding, with hundreds of stands and vendors. We’d recommend to stay overnight here to enjoy its vibe and flavor. At Amphawa you can see whole variety of Thai food from their favorite squid to deep fried sweet dough, many things you can try before buying. The majority of tourists here are locals, mostly from Bangkok, not many foreigners. For us the best time was on Friday late evening, the market was full with vendors, boats, food stands but not very crowded yet. Friday night at Amphawa floating market, all shining and vibrating. Next morning we woke up very early, really early, at 5.30 all to see the monks! Early in the morning Thai people come to the river with some kind of donation, mostly food. 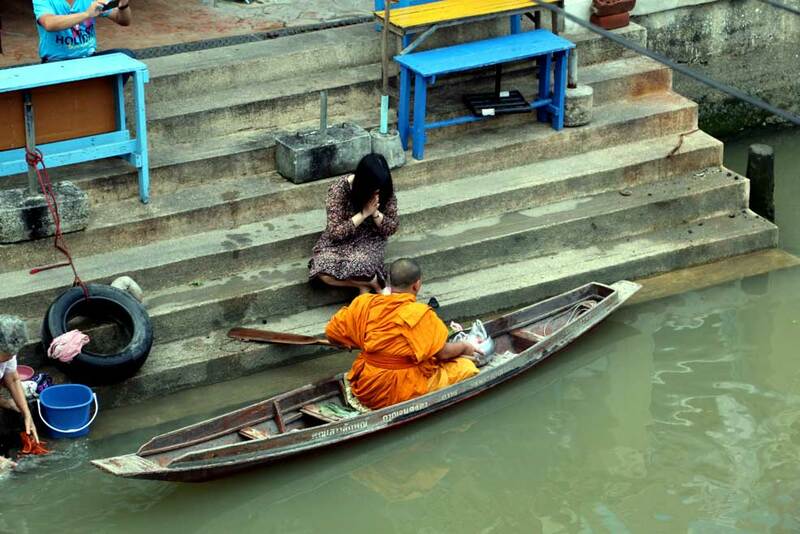 Monks paddle around in small boats and collect donations, all this action is accompanied with some praying. Very interesting culture experience. After watching the monks we went to another floating market, famous Damnoen Saduak, 15min. by bus from Amphawa. Unlike Amphawa Damnoen Saduak is a morning market, main action starts at 8.00 and finishes at 12.00. We took a van from Amphawa (20 Bhat/0,5$) and arrived at Damnoen around 8.00-8.30, just before the majority of tourists from Bangkok. We just got off our van when a Thai lady ran to us, almost drag us to the counter saying we have to take a boat for 40 Bhat to get to the market. When we refused she tried to assure us it was impossible to get there on foot, we ignored her and kept walking on the road towards the market. It’s about 800m to get there and to see everything you don’t need a boat, there are plenty of walks through and bridges. By 10am the main canal got so crowded with tourist boats they couldn’t even drive through. The market itself caters for tourists, snakes for photos, souvenirs, magic medicine etc. 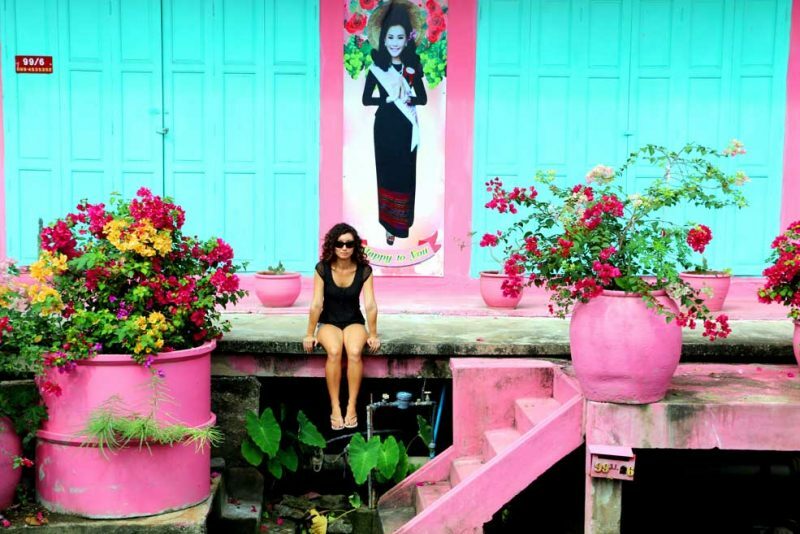 We found this floating market less interesting than Amphawa and more expensive and touristy. Traffic on the river at Damnoen Saduak floating market. On the way back we got off the van half way to see some Wats including famous Wat Bang Koong, temple covered with tree roots. It was quite a walk from the main road, about 5km. You can take a tuk tuk or try to catch one of local truck-buses. On the way to Wat Bang Koong we visited two other temples, as always quite impressive and beautiful. First was Wat…, beautiful white building, meringue looking roof, nobody around except for about 10 dogs sleeping quietly next to the Buddhas. Next was Wat Phraya Yat, very interesting temple, beautiful and elaborate decoration of its facades. Was as empty as the first one. 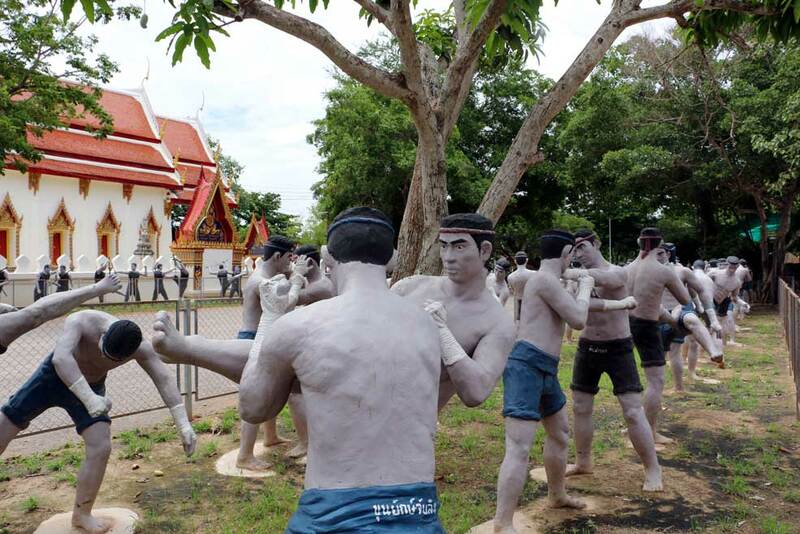 Near Wat Bang Koong you can find dozens of sculptures representing muay thai fighters. If you want to do some training and are interested in learning muay thai Thailand is the best place. Across the road there is some kind of a zoo Bang Kung Camp with goats, pigs, donkeys and one camel, you can buy some grocery and feed them. To finish our intense day we went for a night walk on the market and jumped for a boat ride to watch fireflies. And we saw really many fireflies along the river banks, it was a very good end of our market adventure in Thailand. How to visit two railway and two floating markets in two days? From Bangkok take a train to Maha Chai station, get off there, it’s the first railway market on the way. Then continue by train to Maeklong, the second train track market. From Maeklong go by bus to Amphawa market, stay here overnight, walk around the market, try different food, do a firefly watching boat tour. Next day early morning catch a bus to Damnoen Saduak floating market. 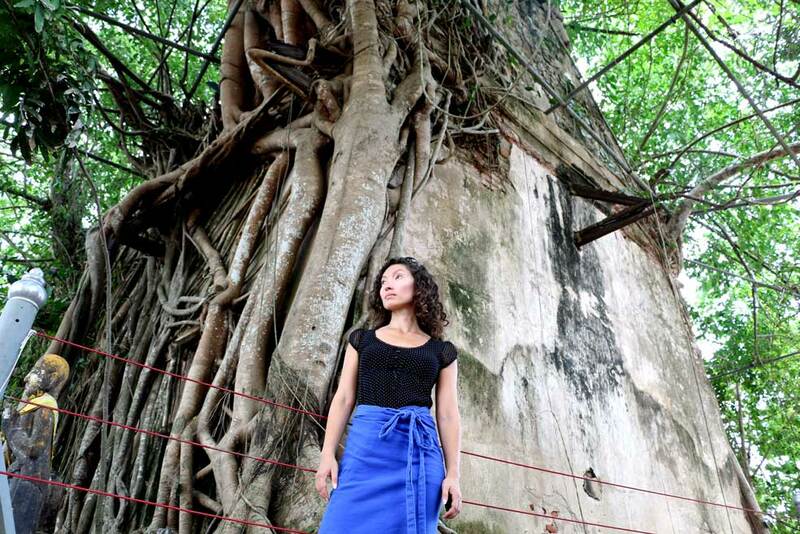 On the way back to Amphawa you can visit some temples including Wat Bang Koong or Tree temple, a temple covered with tree roots. 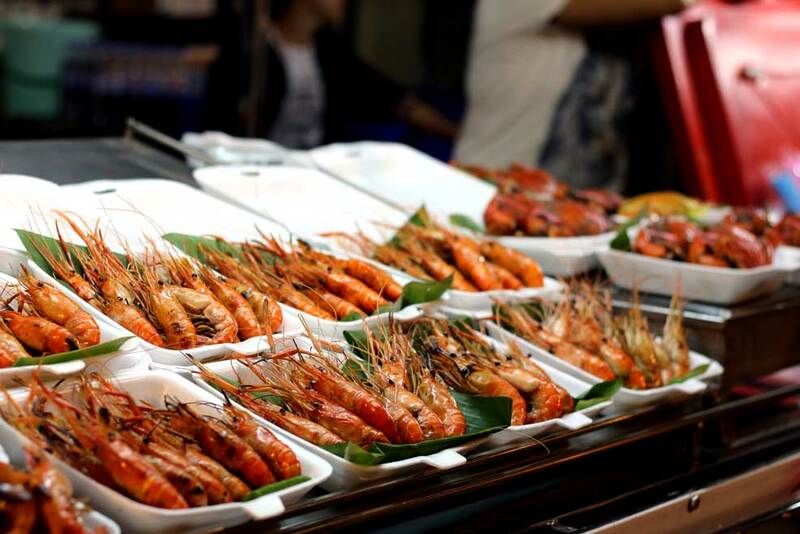 An easier but more expensive way of exploring Bangkok markets is to do one day weekend markets tour from Bangkok that includes visit to Damnoen Saduak and Amphawa floating markets, Maeklong Railway market, the Tree temple, fireflies boat watching tour and pick up and drop off at your hotel in Bangkok. This tour is a great option for families with children and couples traveling together. There is a cheaper tour option from Bangkok that takes tourists to Maeklong Railway market and Damnoen Saduak Floating market. 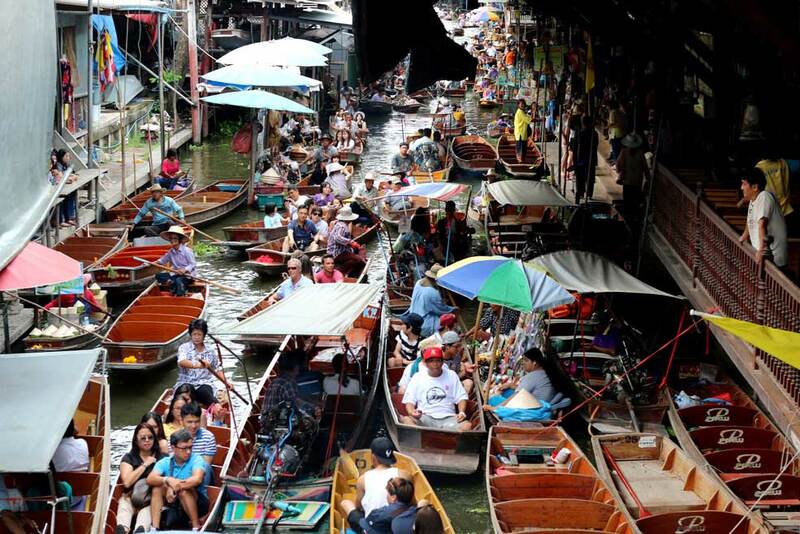 Which Bangkok’s floating and railway market is the best? 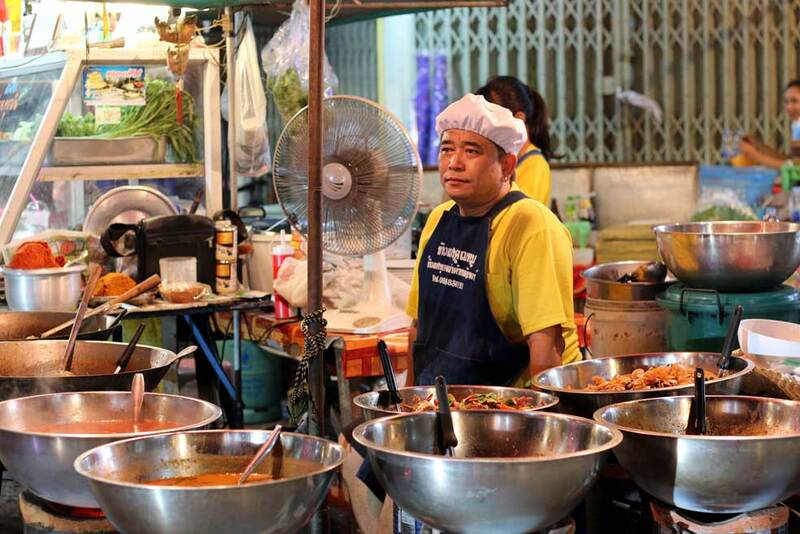 If you have to choose only one market go to Amphawa, it’s the most interesting, colorful and bustling out of four. Let’s compare two railway markets and two floating markets. Maha Chai is the winner. Why? 1. There are no tourists walking in hundreds around and taking photos. 2. For mentioned above reason everything is cheaper. 3. It’s easier and faster to get there, just 1 hour train ride from Bangkok, for 10Bhat. 4. They don’t sell T-shirts, caps and other crap touristy staff, only fish, seafood and fruit. Definitely Amphawa. 1. Less touristy, mostly Thai people from Bangkok. 2. Opened from morning till late, 9-10pm, at night gets very colorful and bright. 3. Here you can find a lot more typical Thai food, all these squids, shrimps, dried fish, pork balls, fried dough etc. 4. Food is cheaper at Amphawa. 5. You can walk around, take photos, videos and nobody tries to insist on buying something. 6. Can taste many things for free. 7. Nobody tries to charge you more because you are a tourist. The good things about Damnoen Saduak is that it’s opened every day, from 8.00 to 12.00 and there are more selling boats than in Aphawa. In Amphawa there are more things to do and to see except for the market. Wake up early to watch Buddhist monks collecting donations on the river and to experience different atmosphere of Amphawa market early in the morning. Visit Wat Bang Koong and other impressive temples around. You can do a tour (100 Bhat/3$) or go on your own jumping on local jeep-buses (10 Bhat/0,2$). Visit quite Rama 2 park and nearby temple Wat Amphawa Chetiyaram, right at the end of the main market street. Watch fireflies on the river banks. The tour costs 60 Bhat, you drive in a speed boat along the river with some stops at the spots with many fireflies. Additional to fireflies you’ll get a chance to see many bats specially when go under bridges. We liked this tour, many fireflies, pleasant trip through night market, on the way you can see some temples and a huge sitting Buddha, the statue looks quite impressive in the dark. Amphawa market is quite a popular place for locals to come on weekend like in any other touristy place in Thailand there are plenty of accommodation options here for different budget and travel style. 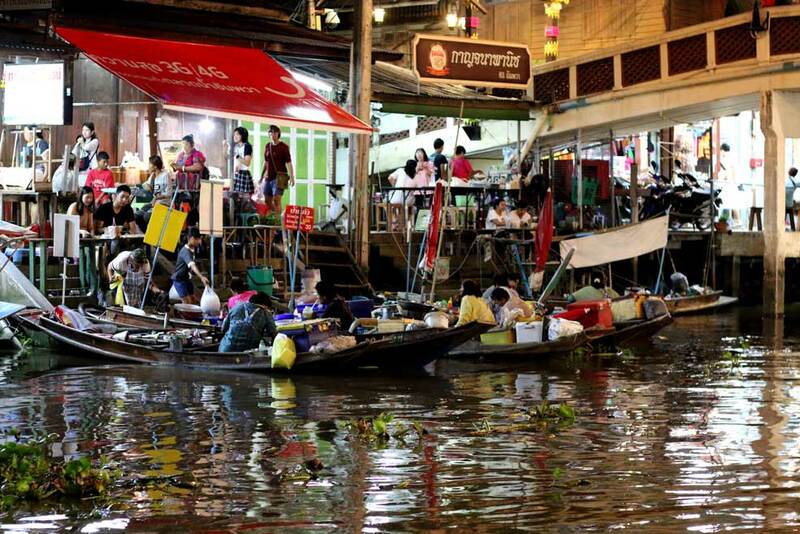 How to get from Bangkok to Amphawa floating market? There are many options from hiring a car to using public transport. You can take a mini bus from the Southern mini van station, buses leave every hour, trip takes 2 hour, costs 90 Bhat pp. It’s maybe the easiest way of getting from Bangkok to Amphawa floating market except taking a private shuttle from your hotel (if it’s available). We chose probably the most complicated though the most interesting and the cheapest way, trains. It took us a half of a day to get from Bangkok to Amphawa market but the journey was an experience on its own. First step. Get to Wongwian Yai train station in Bangkok. You can get by MRT, nearest station has the same name Wongwian Yai, price from 21 Bhat/0,5$. We took a bus №4 (more options bus №149 or 173) from Lumpini park, 8 Bhat/0,2$. Second step. Train Wongwian Yai station to Maha Chai, takes 1 hour, price 10 Bhat/0,3$. Check trains timetable at the end! Third step. Get from Maha Chai station to Ban Laem train station. Need to cross a river, short ferry ride (3 Bhat/0,1$). After the ferry about 10 min. walk to Ban Laem station. Forth step. Train Ban Laem to Maeklong, 1 hour, 10 Bhat/0,3$. Once in Maeklong check famous railway market, you arrive right there. Fifth step. Bus (van) Maeklong to Amphawa, the bus stop is one block away from the train station. Bus costs 8 Bhat/0,2$, van 20/0,5$. Want to book a taxi to pick you up at your hotel direct transfer Bangkok to Amphawa Market? Search for public transport prices and make secure bookings directly on Asian Public Transport here. If you want to go off the beaten trek and see a bit more then ordinary tourist, Amphawa is the place to go, great experience with Thai people. 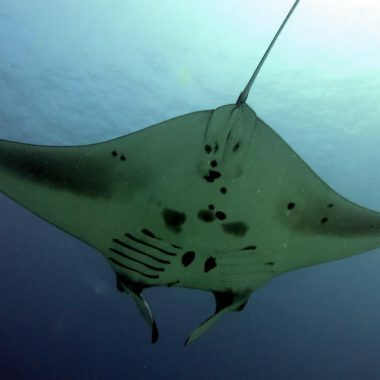 It’s always recommended to have a travel insurance when you go abroad especially if you’re planning to move around a lot by public transport and to do some outdoor activities like diving, snorkeling, surfing or just driving on a scooter. Make sure you will be able to get medical assistance any time you need. It’s quite handy to have an insurance in case of a luggage loss, flight delay or cancellation and other emergencies. Insurance makes traveling less stressful when you know you’re covered in case of any unpredictable emergencies. World Nomads insurance company operates all over the world, they have special packages for traveling around Asia. It doesn’t matter where you live or where you are at the moment, it takes less than 2 minutes to get a quote and you can buy it online even if you are already traveling. Note! Make sure to read the small print and be sure you buy the correct policy. The pretty half of Stingy Nomads, responsible for all our land adventures (hiking, climbing, walking the Camino) and following them write-ups. Alya loves walking since she was a child, she prefers to walk a 1000 km with a backpack rather than to do a 10 000 km road trip (actually any road trip). Alya is a big fan of Latin America, Spanish language and dancing. Every time we go away she desperately misses our dog Chile. Do you remember what boat tour you took at Amphawa to see the fireflies? Did you guys book it beforehand? Hello, Laura! We didn’t book it in advance we were walking through the market saw this tour advertised at the river and got on a boat. You won’t miss it there is only one place where the market crosses the river. There are several boats doing it I don’t think it’ll be a problem to get a spot. thanks for your story,, very helpful for me ..
Hi, Orlando! Thank you! We’re gland it was helpful for you! 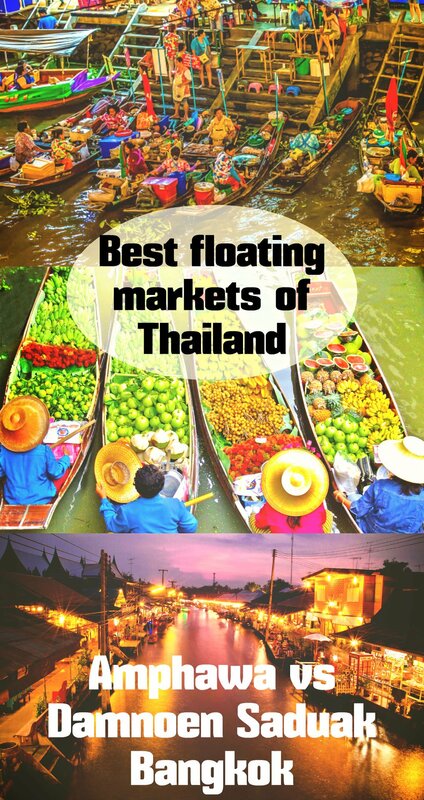 Hope you’ll enjoy Thailand and its Floating markets. Thanks for your sharing! Wandering around Amphawa Market is really an interesting experience but the thing I impress most is the cruise on the river in the night to see fire – fly. Totally agree we really enjoyed the fire-fly boat tour a lot! I’m a big fan of markets too and I do look for authenticity when it comes to experiencing the sights and sounds of a marketplace. 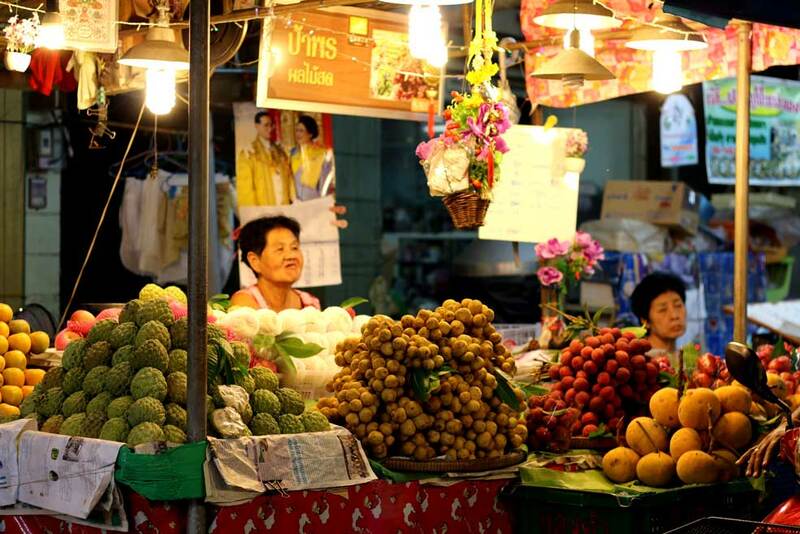 One of it is Khlong Toei which are mainly visited by locals and they sell every fresh produce imaginable! Hi, Danial! Thank you for the comment, we didn’t know about Khlong Toei market. So cool seeing the monks paddle around for alms. Never seen that in my life. I do wake early at times in Thailand to watch monks go through their daily alms routine. And to observe locals giving to the robe and receiving prayers. 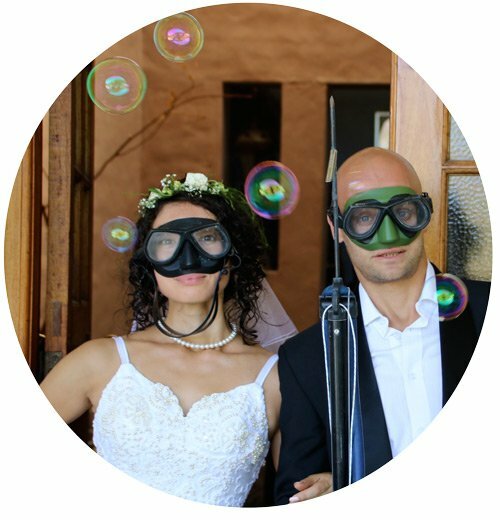 Great shots guys! Hi, Ryan! Thank you for the comment! Watching monks in Amphawa was interesting experience something very different from bustling streets of Bangkok and partying islands.